Hi folks! As you know, I recently got married in Saint Louis, MO, so it’s quite appropriate for me to say I’m a bit of an expert on planning a wedding in Saint Louis (as would any bride after all the work!). I thought I’d take some of the things I learned along the way and turn them into this little post for you all! One of the hottest wedding venues in Saint Louis is the Maison Du Lac. I took a little tour of this place before its official opening, and lets just say, it was QUITE spectacular. A lake, a cottage AND a venue, all in one!? It is totally the rustic-chic wedding venue of dreams! The venue was actually opened by Ces & Judy’s in April of 2018, a company that is dear to me, as they catered my wedding! As you read back in my wedding day post, they were able to navigate all my recipe desires to create a really delicious menu of Mediterranean meets American blended cuisine. From adding flavors like taziki sauce to lamb skewers, or goat cheese to risotto, we definitely went out of the box when planning an Arab wedding. Bridal Suite: The first thing that caught my eye was the bridal ready area. 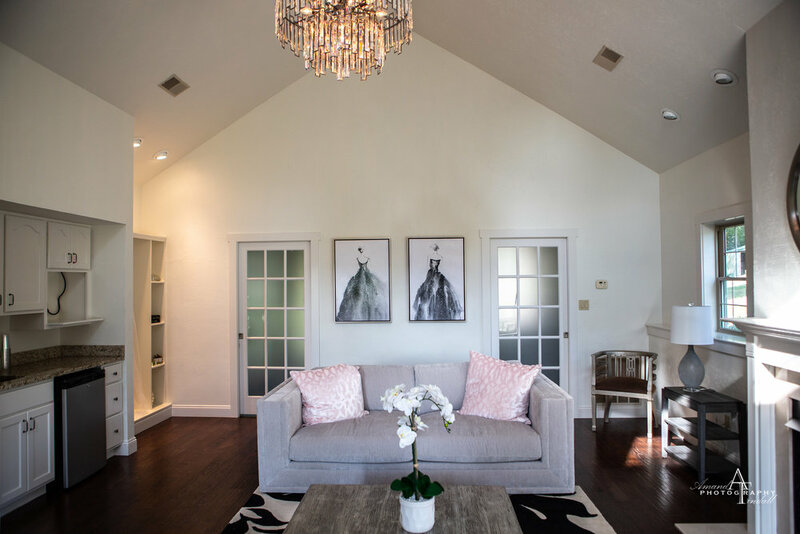 Its a modern luxe suite that features a living room area, a large bathroom, wardrobe closets, and so much more for you and your bridesmaids. It’s so picturesque for all of your fun, friend photos too! It’s definitely amazing to see venues incorporating a bridal suite on site to help reduce the anxiety of the wedding day (and can be back for touch ups / changes all night!). Aesthetic grassy areas: These natural spaces are the best when wanting an area for outdoor ceremonies, games, dancing, or even just photos. It makes everything look so much more beautiful and aesthetic, and really lightens up the mood of the crowd. I’m especially excited about the lake on site, which is very rare to find at venues in Saint Louis! Ballroom with windows and open spaces: the best part about the venue indoors is that you’re still able to feel like you’re outside. You don’t want to feel that the party is limited to just a hotel room, or ballroom, but rather the entire venue is part of the ceremony! Overall, if you’re looking to plan a wedding, or even a large event in Saint Louis, I’d highly recommend visiting the Maison Du Lac for a tour. It’ll be sure to captivate your eye, and shape the rustic-chic wedding or event of your dreams!